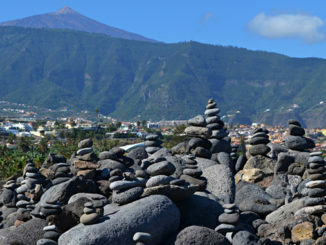 It is one of the most spectacular walking routes on Tenerife and therefore should be one of the most enjoyable. But every time we walk it, I find my curse count increases. The Masca Barranco is beautiful but there’s a danger of it being ruined by people who don’t have a respect for the countryside or other walkers. 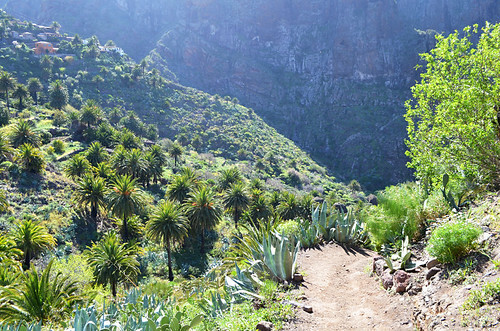 It is unlike any other walking route on Tenerife and on it you’re likely to meet people you’re unlikely to meet on any other walking trail on the island. 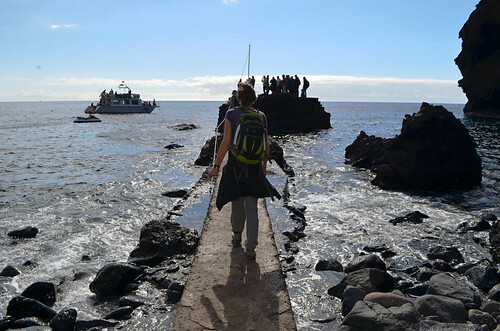 Being the most popular walk on Tenerife, with idyllic Masca and the lure of a boat ride home, it attracts people who wouldn’t normally do this sort of thing. Some can have you banging your head against the nearest wall… sometimes literally. There are some excellent walking companies on Tenerife with well trained and knowledgeable guides… and then there are others. I’ve bitched about walking groups in the Masca Barranco before where oversized groups can block the path, making progress for anyone else positively dangerous. 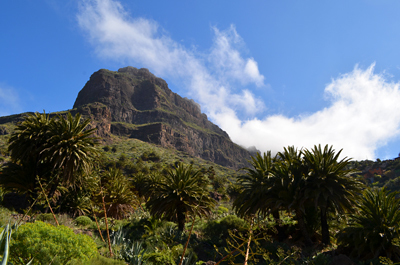 We’ve walked with guides on other Canary Islands who’ve ‘managed’ their groups excellently. 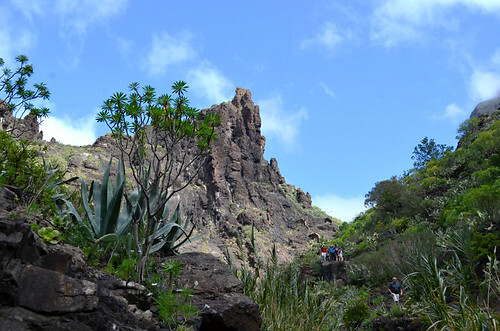 On our latest yomp through the Masca Barranco we saw a guide who, to put in bluntly, didn’t. He rushed ahead at his own pace, resulting in his ‘far too big’ group being strung out along the path. Every so often he stopped to let others catch up (and to have a fag) and then he was off again. We passed him and his group countless times, having to negotiate the path to get past the massed hikers before, a few minutes later, him and his lead group were snapping at our heels again. I’ve criticised walking companies for taking people who simply weren’t fit enough to tackle the route – partly the reason there are so many injuries on this particular walk. However, to be fair, if someone insists they’re fit enough, there’s not a lot anyone else can do. In the group mentioned above was a woman who was clearly struggling from early on in the route. We watched her wince on a section that wasn’t anything like as challenging as the scrabbling over rocks to come. Whether the pace of the guide had been too fast initially or she’d injured herself who knows? Her gear suggested she was no stranger to walking. But she had a long, hard walk ahead and we feared for her safety. “Beep. Beep. Get out of my way, I’m coming through” – Some people come down that barranco as though they’re being chased by Wile E. Coyote. What’s the rush? The ancient scenery and jade pools of Masca Barranco should be savoured, there’s no point in doing it otherwise. On this occasion we watched one girl smack her head against a rock because she was in too much of a rush and another woman slip into a pond because she couldn’t wait for the safest path across it to be free. If they want to risk injury to themselves that’s up to them but the problem is, in their hurry they get intimately close to other walkers, putting them under pressure and increasing their risk of making a mistake. Who needs a path when you’re a macho man? These guys (it usually is the male of the species) treat the Masca Barranco like there’s a straight path right through the middle of it. It doesn’t matter whether the path veers around a waterfall or drops down to skirt ravine walls that would have a goat hesitating. They take the direct route whether it makes sense or not. There are so many of these macho men that there are now misleading sections throughout the barranco where they’ve barged through like a herd of wildebeest with the king of the jungle in hot pursuit (they’re often road runners as well). More amusing than anything else, the fashion model looks wonderful, but is dressed for a fashion shoot rather than a walk down a rocky barranco. Lying Laura is ever so helpful. She is always going in the opposite direction to you. When she spots you heading along the path she’ll advise ‘not that way, the path is this direction‘ pointing back the way she’s just come. When you survive scrabbling through thick cane or across slippery rocks you spot an easier path coming in from another direction… the one you were originally following. 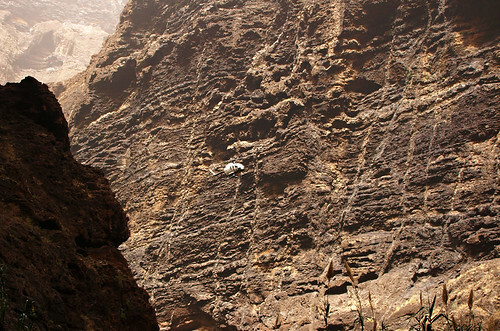 One of the most dangerous of types who walk the Masca Barranco. Charlie (or Charlene) has never set foot in the countryside before and hasn’t a clue about how they interact with their surroundings or the effects of their actions. Subsequently Charlie (or Charlene) will stop to let you past where the path is at the narrowest and exactly at the point where one wrongly placed foot could have you tumbling into an abyss. 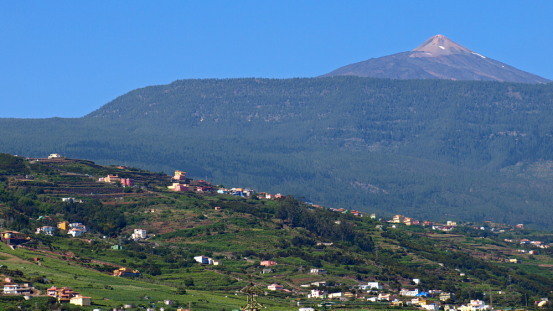 Moaning aside, it is fantastic that so many people make the effort to experience one of Tenerife’s highlights and ultimately, the high numbers don’t detract from what is a cracker of a walking route. 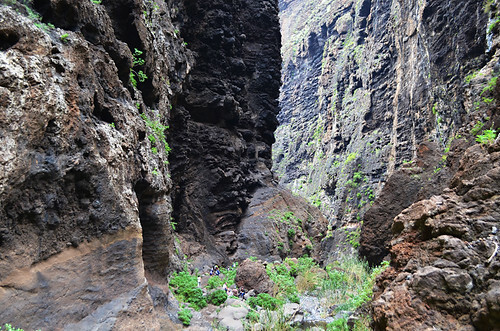 But I’ll be glad when the Barranco del Infierno opens again and possibly siphons off some of the ‘colourful’ types of people you meet on the way through the Masca Barranco. 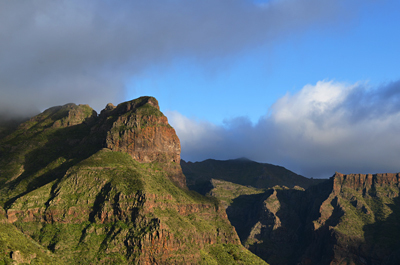 The Masca Barranco is featured in our West World walking routes. 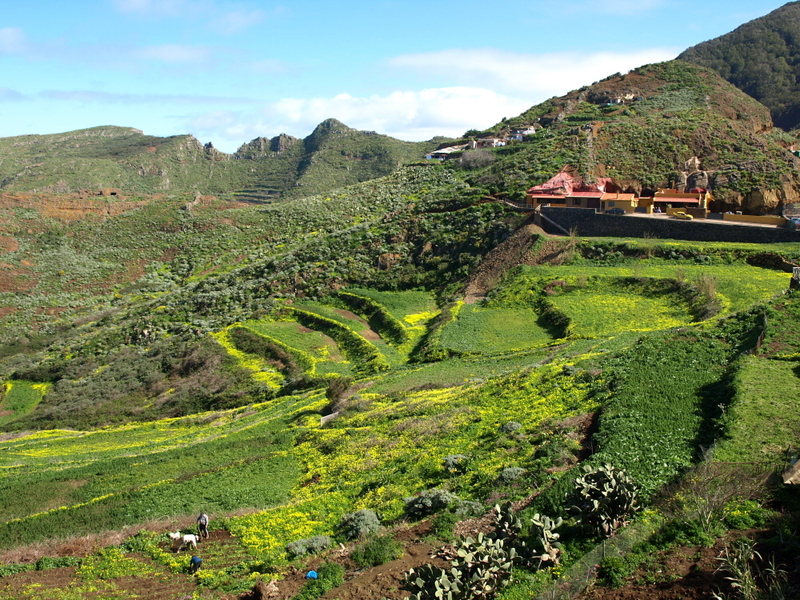 There’s a very easy way to avoid the Masca crowds. I was staying in Puerto Santiago and I got a taxi which included the ferry back to Los Gigantes. meet the groups who had chosen to walk up! It was an amazing experience to me the only one on the way down. All this happened in early May. Sorry it’s taken so long to publish your comment (we’ve been checking out walking routes in Austria). It’s a good tip for anyone staying in the south west area and an ideal way to do it. Unfortunately for us, travelling from ‘up north’, it’s a bit more complicated. Even with two cars last time, by the time we made the journey across, parked one car in Los Gigantes and drove back to Masca, we were well into the ‘busy’ period on the route. Also a great tip for the route above Masca. Thanks.